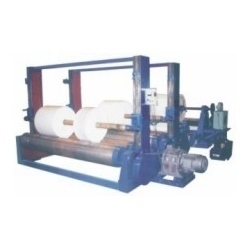 A wide range of slitting & rewinding machines is offered by our organization. Made of high quality raw materials these equipment are manufactured using advanced technologies. These devices adopt vertical cutter and round cutter and are very effective for slitting. Floor Space 80" (2032 mm) 14 ft. x 12 ft. Optional Auto tension at Unwind, Web guiding & Shaft less Unwind unit. Established in 1972, we have proved ourselves as a successful manufacturer, exporter & supplier of Paper Converting and Printing Machines. The products we offer are well appreciated by our clients due to their high quality, satisfactory services and suitable usages in various converting industries. We are certified by ISO 9001:2008. Our offered range of products comprises various slitting & rewinding machines, printing machines, label inspection machines, sheet cutting machines, coating & lamination machines and other requisite machines. Before manufacturing the products, we ensure that only quality raw materials have procured from the vendors. We implement innovative techniques in the manufacturing process which help in delivering utmost quality to our clients. Besides, we offer customization along with after sales support to each range of products. With the support of our skilled engineers, fabricators and trained technicians we come with a comprehensive range of quality products. We also provide standard and custom designed equipment as per the requirements of our clients. Further, our effective customer care unit and after sales support help us in gaining large client base across the Indian as well as in internationals markets. Turnover: Up to US$ 0.25 Million (or up to Rs. 1 Crore Approx.